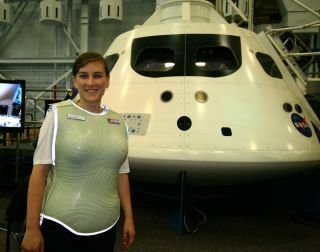 Dana Vaisler of StemRad wearing an AstroRad vest prototype in front the Orion crew capsule at NASA's Johnson Space Center in Houston. The vest contours correspond to enhanced protection around sensitive organs — bone marrow, colon, stomach, ovaries and breast tissue. NASA and the Israel Space Agency have signed an agreement to use the AstroRad radiation protection vest on Exploration Mission-1 (EM-1), the uncrewed first flight of NASA's powerful new Space Launch System (SLS) rocket. The threat of radiation exposure is high on such deep-space journeys, posing potentially significant dangers to crewmembers. While Orion is unlikely to encounter a powerful solar storm during the relatively brief EM-1 mission, the spacecraft will pass through the Van Allen radiation belts, zones of energetic charged particles that emanate from solar winds. So AstroRad will get a trial in high-radiation conditions, project team members said. If the test is successful, AstroRad will be used on crewed missions to deep space. Additionally, the vest is expected to be used aboard the International Space Station beginning in 2019 for advanced ergonomic studies in microgravity. For more information on StemRad, go to www.stemrad.com.